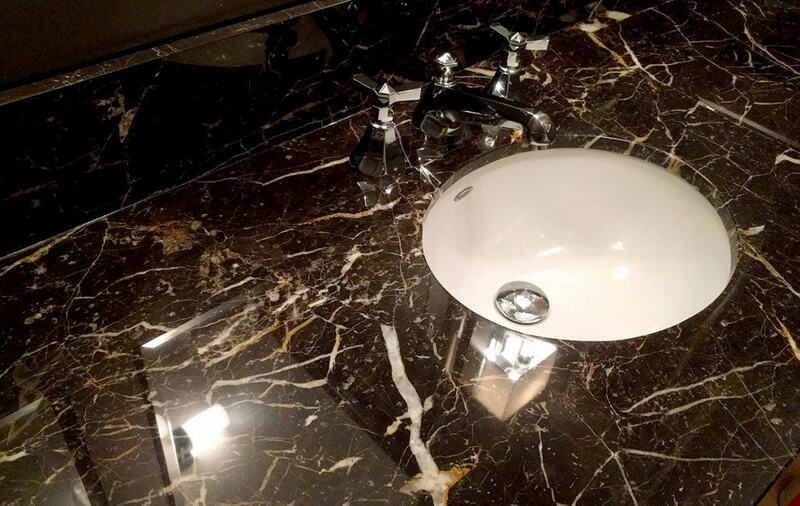 Gallery • Intex Surface Solutions ltd.
A complete restoration of marble counter tops. 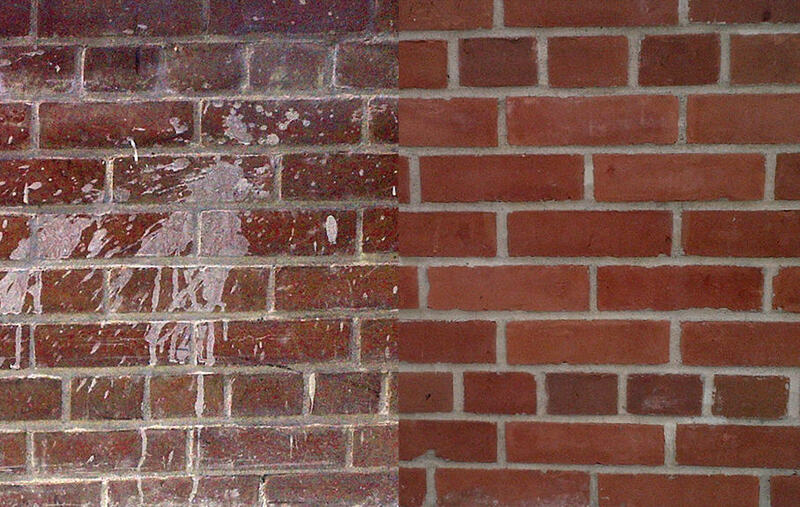 The original finish was left too shiny, resulting in the high visibility of etches and wear patterns. 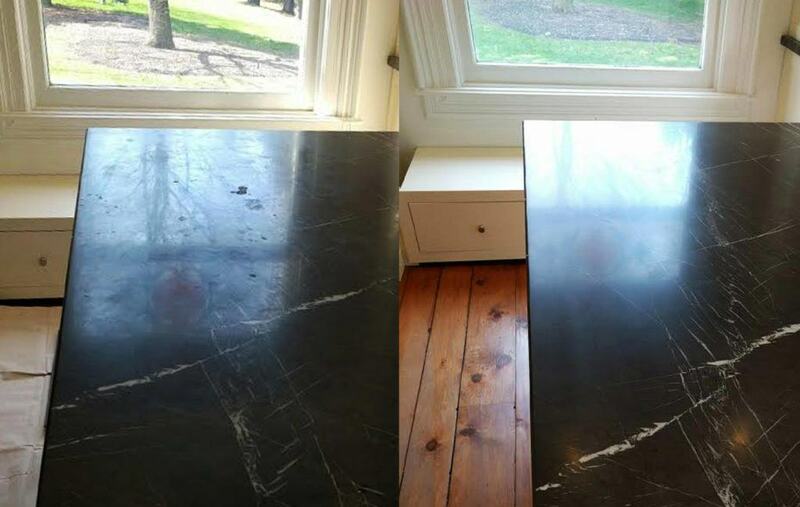 We ground the entire counter top below the damage and re-surfaced to a low hone. 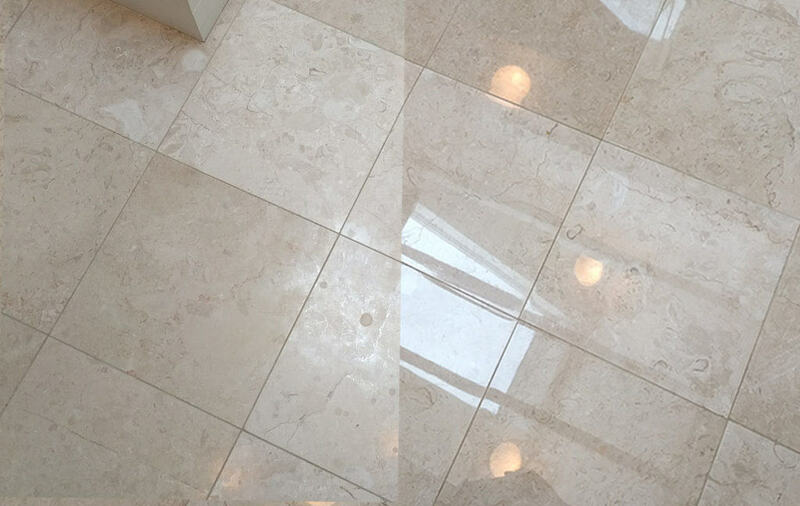 The entire surface was then sealed with a penetrating colour enhancer, providing the client with a more attractive and forgiving surface. 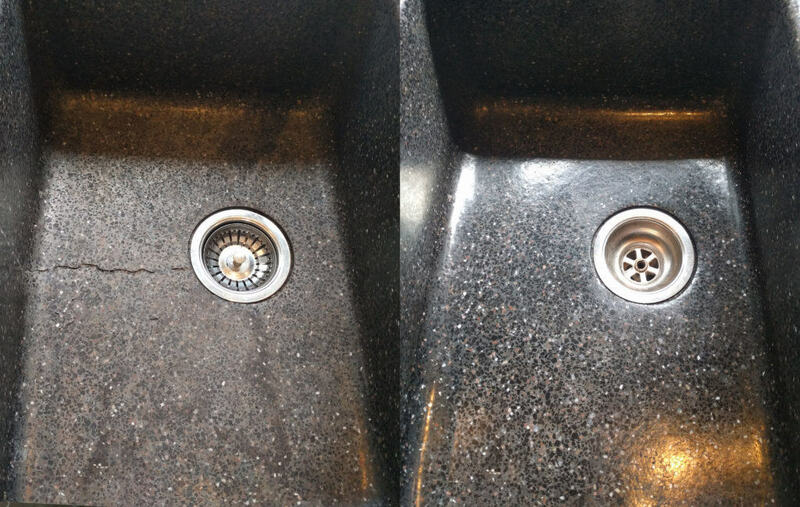 This is an example of our work repairing an extreme crack in a terrazzo/stone chip sink. 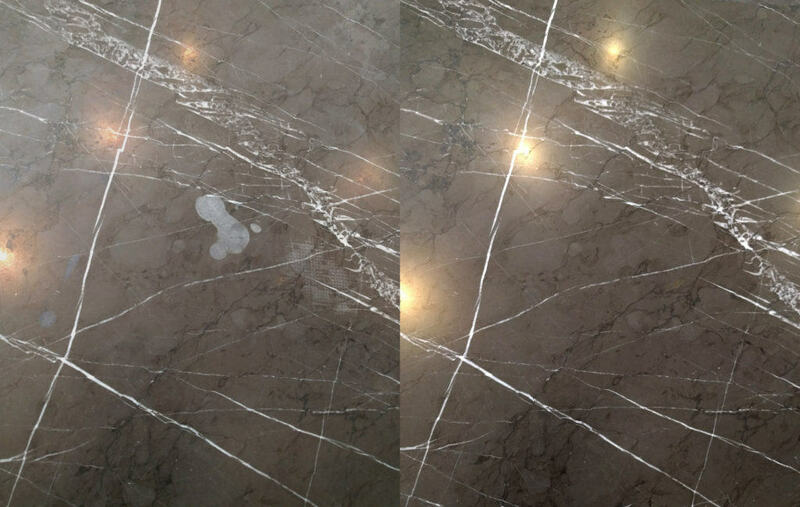 The crack was cleaned and profiled with a rotary tool to create an ideal substrate for epoxy adhesion. 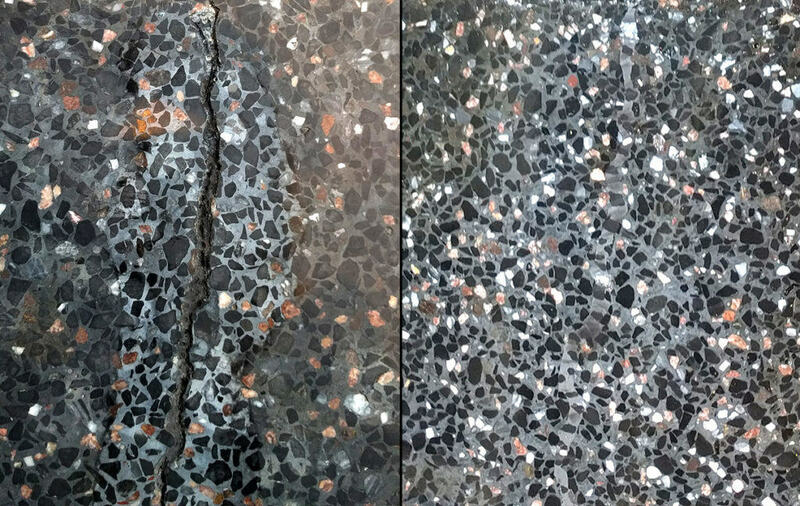 Layers of epoxy were mixed on-site to several appropriate colours that were patiently layered to match the existing stone chip pattern. 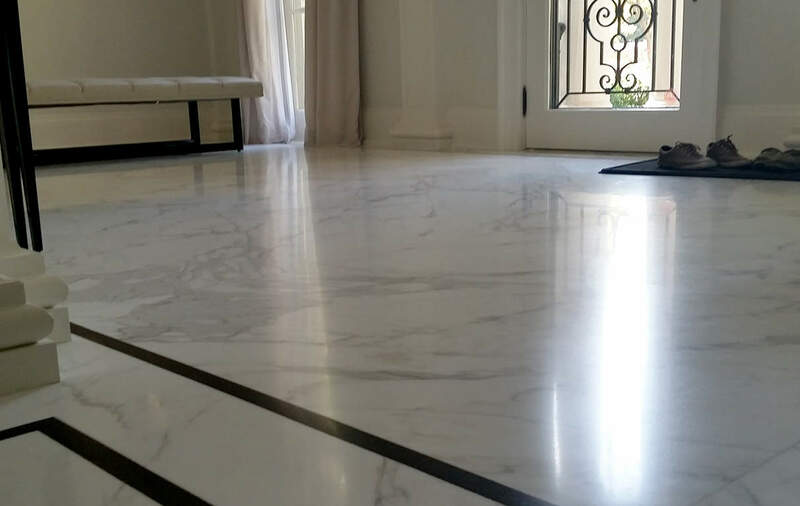 Once cured, the entire area was sanded flat, re-surfaced to a smooth finish, and heavily sealed to prevent water absorption. 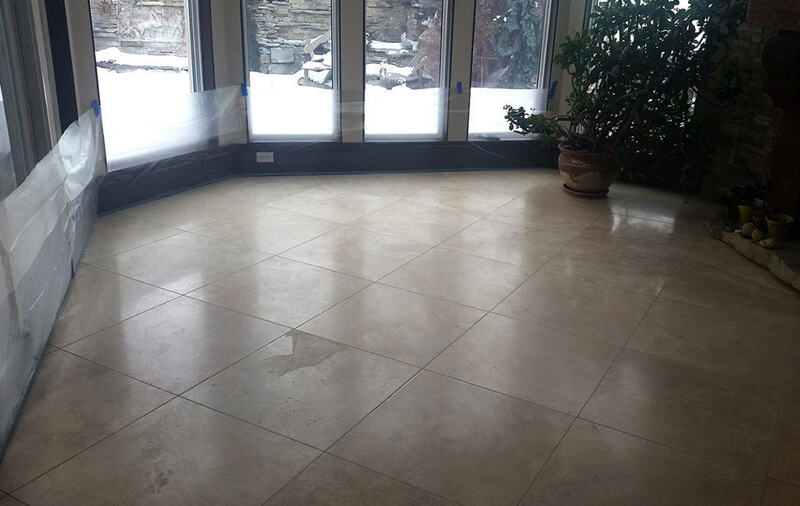 We've come across many heavily damaged floors in both commercial and residential settings. 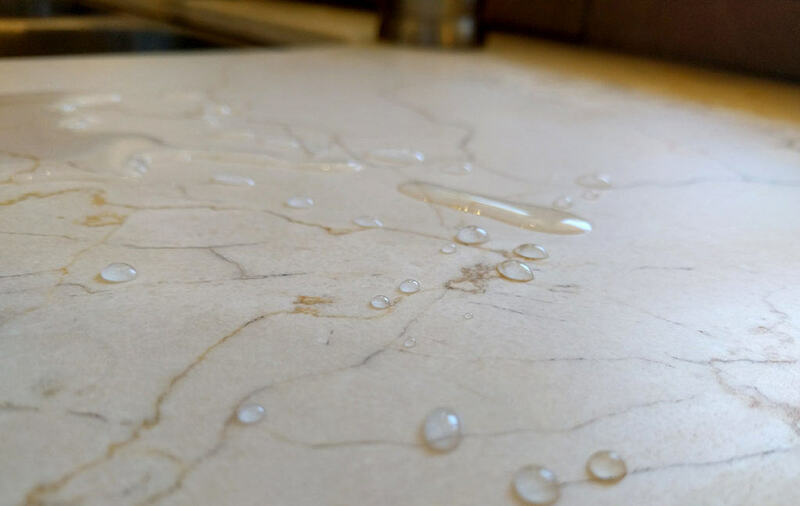 While most natural stone is vulnerable to damage and general wear, it is also extremely versatile. 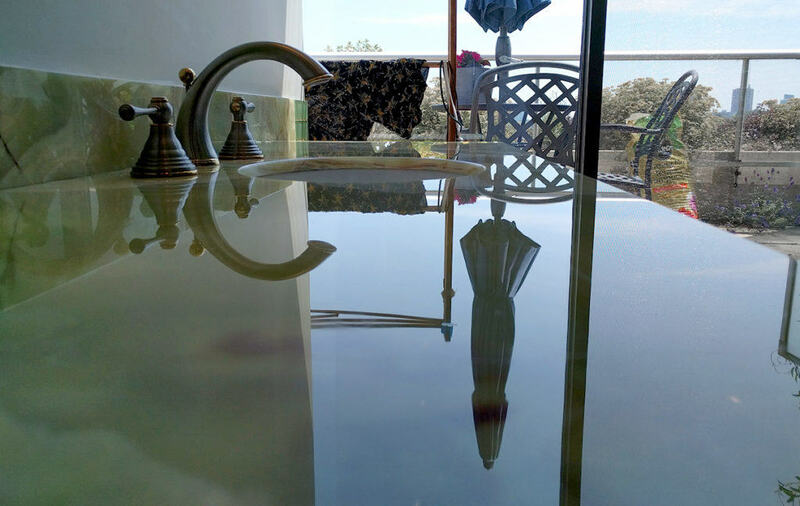 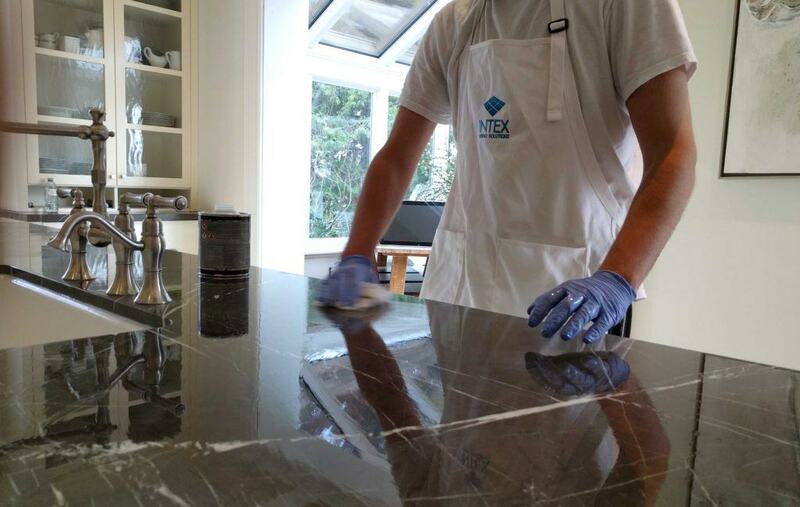 We restore these surfaces to best suit your needs and satisfy your taste. 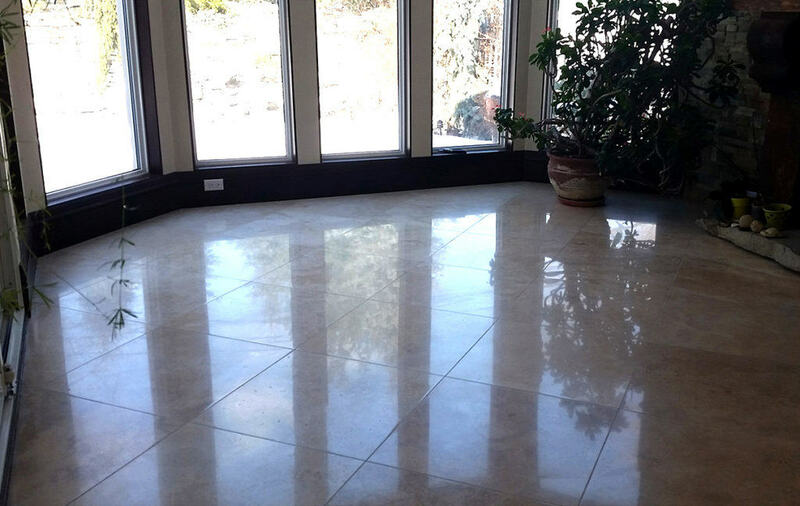 We can make the dullest floor shiny or provide a wide range of patina or honed finishes that may be easier to maintain. 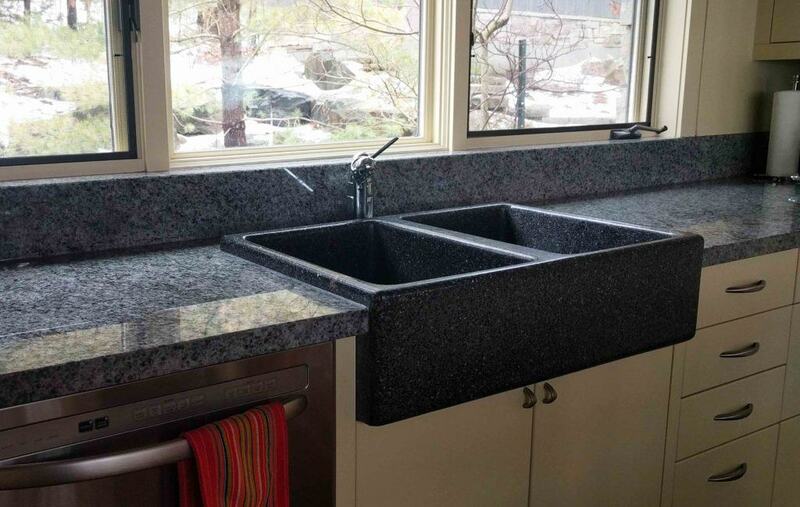 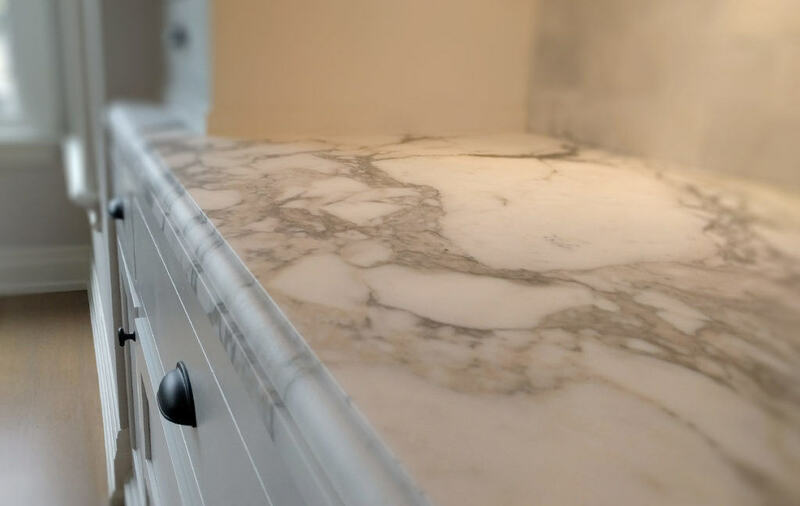 We offer a range of solutions for natural stone counter tops in both high and low traffic areas of your home. 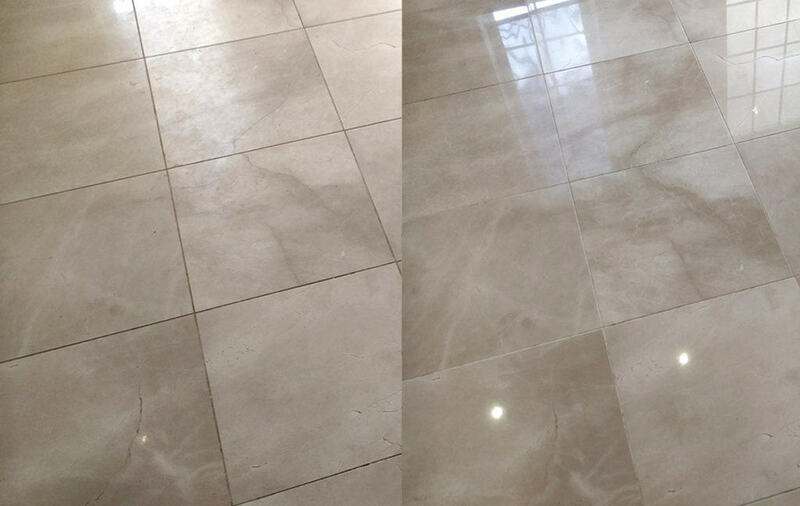 Our services include scratch and etch removal, chip and crack repair, resurfacing, sealing and silicone replacement. 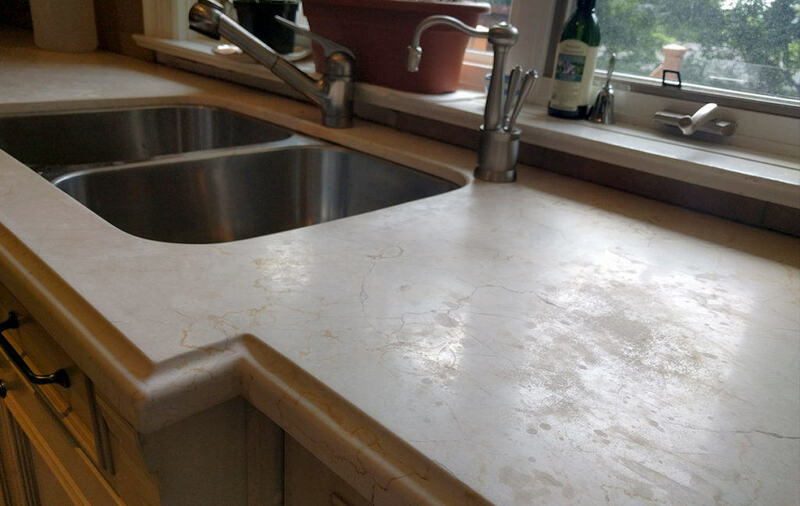 Resurfaced crema marfil counter to a honed finish. 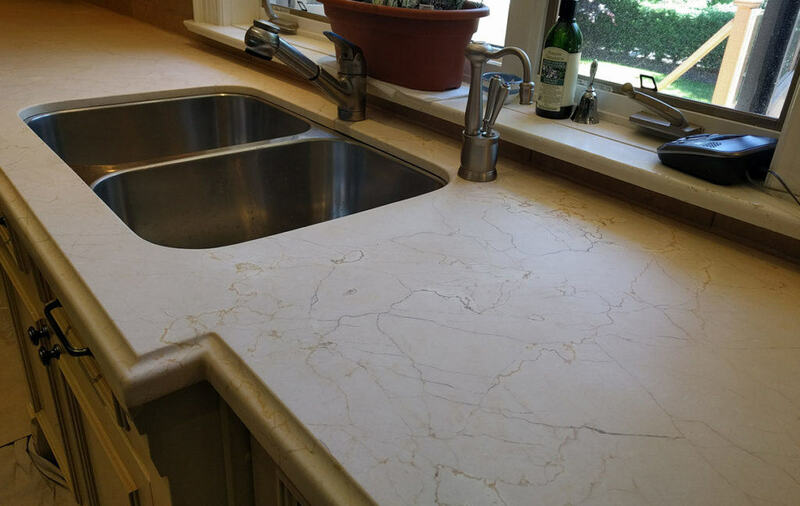 Final seal on crema marfil counter top. 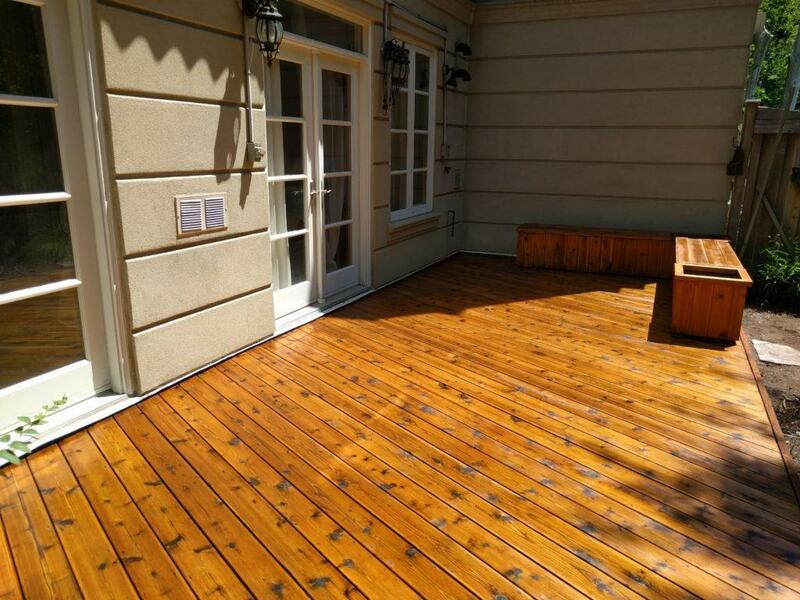 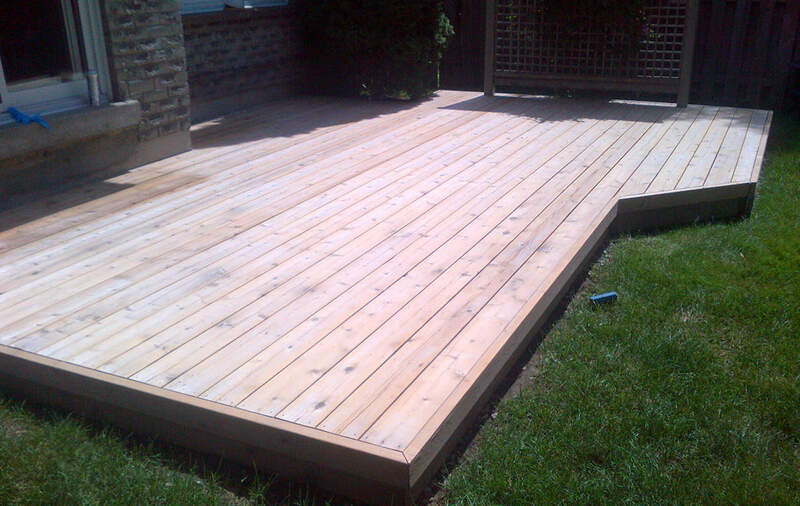 Prioritizing environmentally conscious methods, we use only the highest quality, downstream safe products when cleaning and preparing your exterior wood for stain. 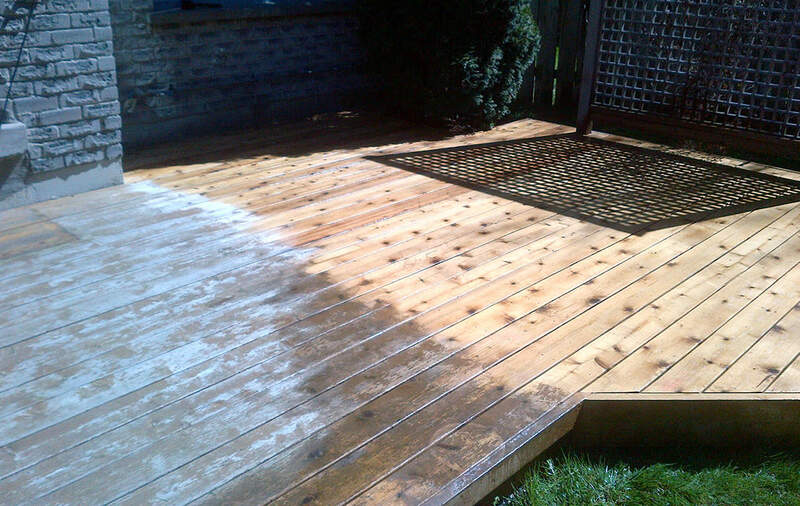 Our stain combines both drying and non-drying penetrating oils. 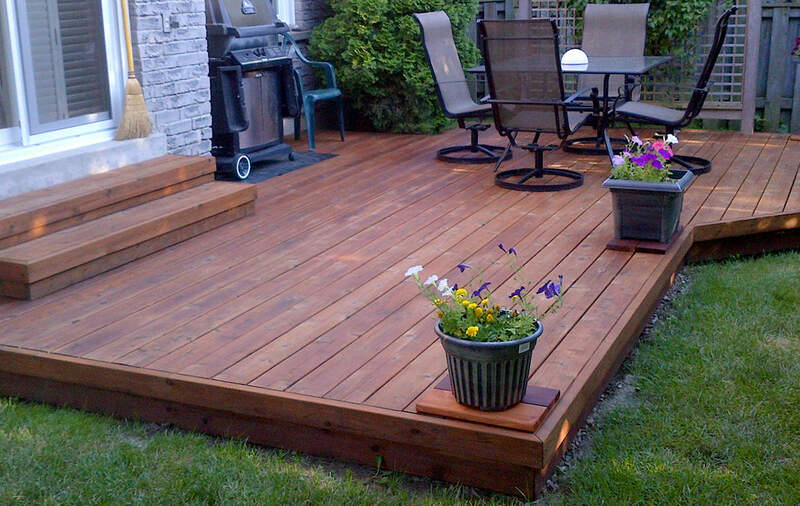 These oils condition and protect your deck naturally. 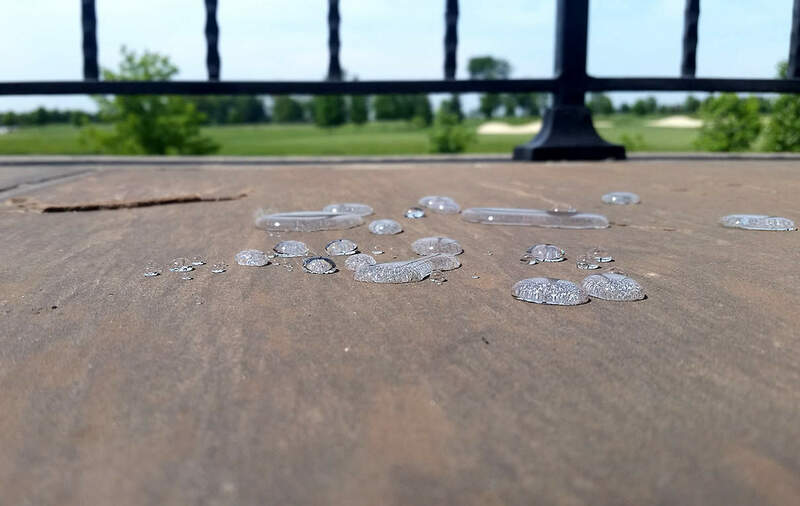 Most importantly, maintenance is a breeze as our stain can be re-coated without needing to be stripped or re-sanded like many topical sealers on the market. 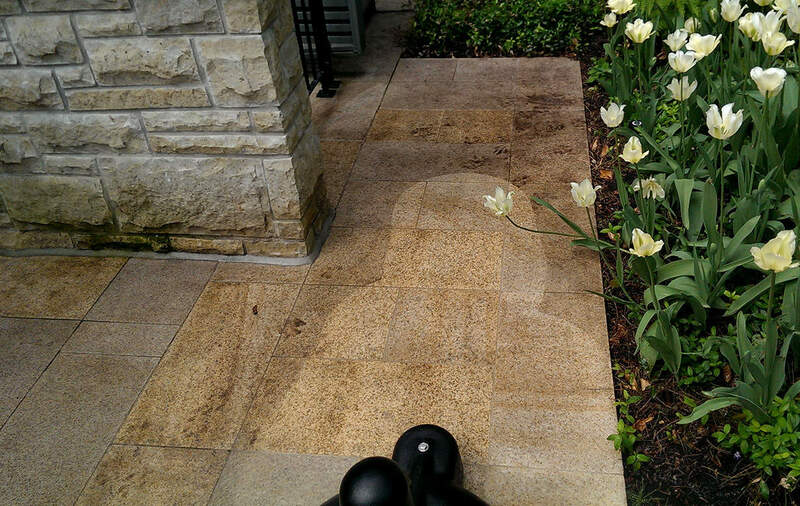 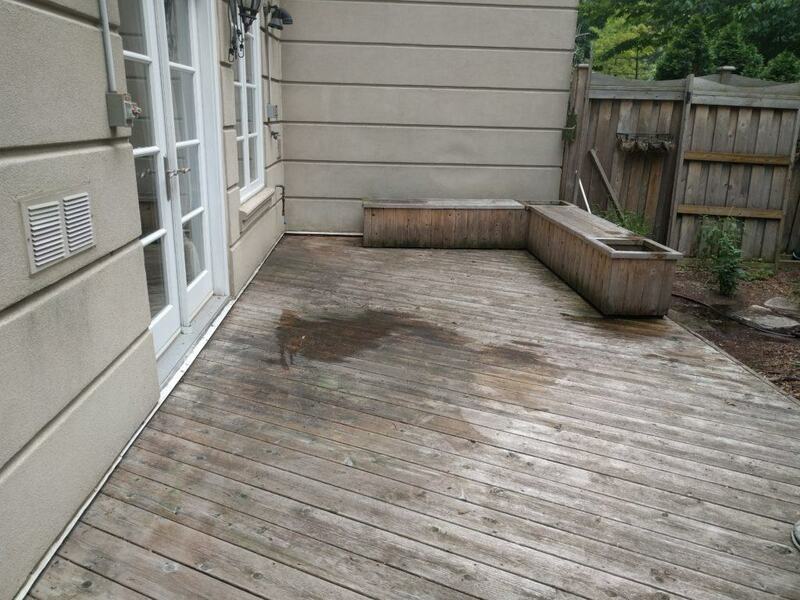 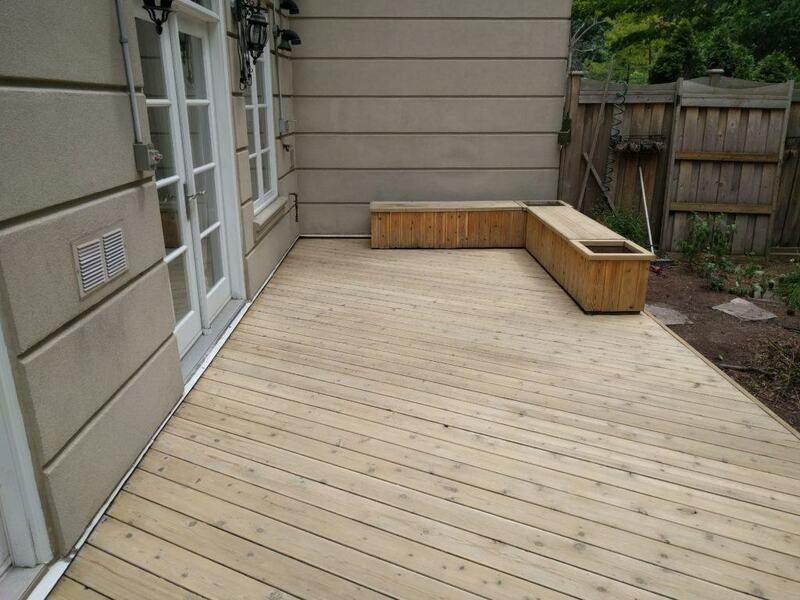 We offer a wide range of specialized exterior services – pressure washing, polymeric sand replacement, sealing, construction clean-up in both residential and high volume commercial spaces – to name a few. 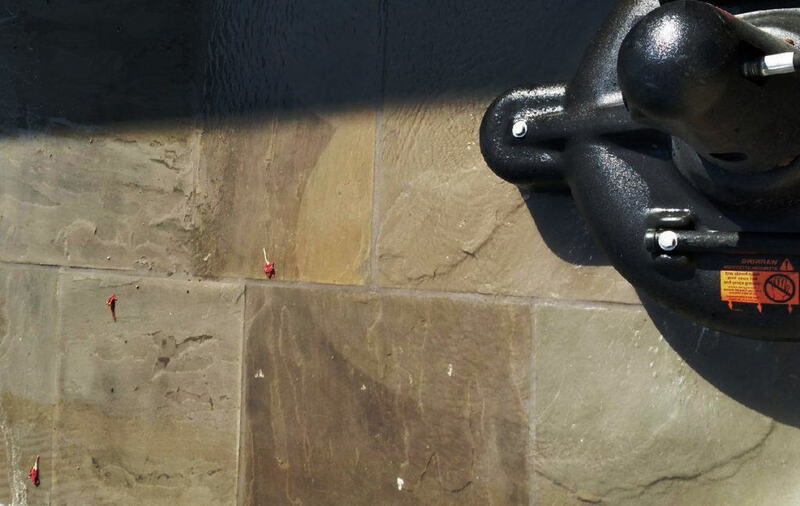 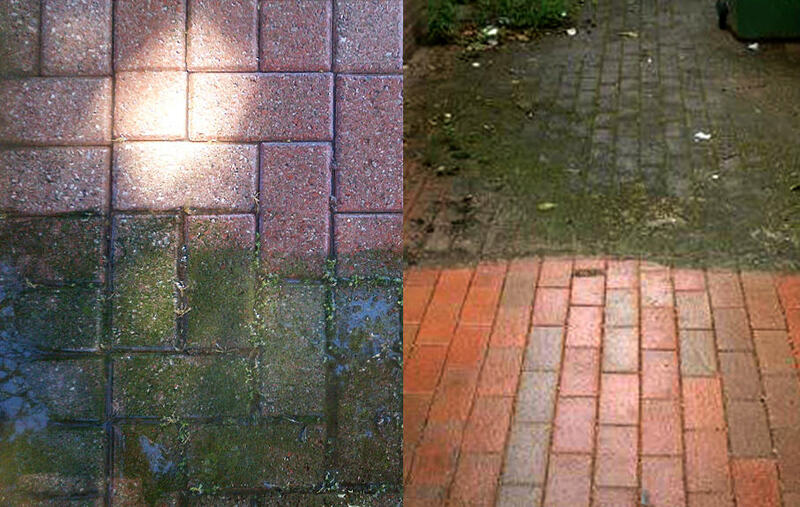 Our expertly trained technicians will restore and rejuvenate even the most delicate artificial and natural surfaces. 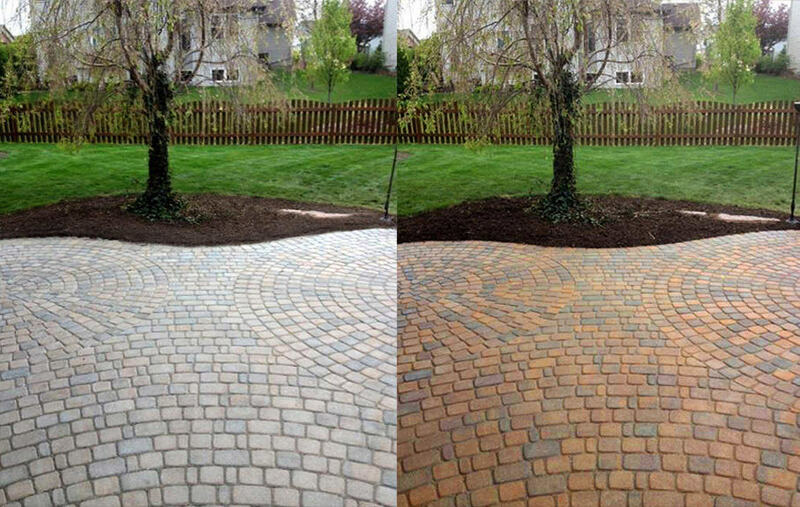 Colour enhancing sealer before and after application. 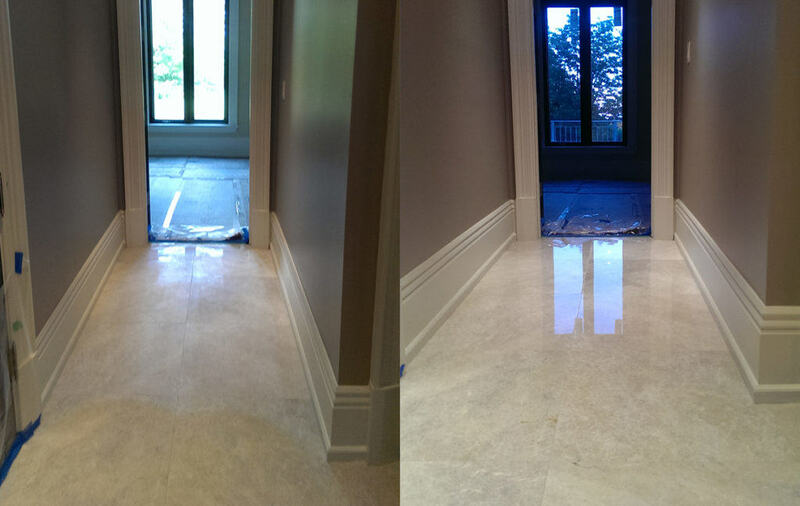 Call or email to discuss your restoration project.